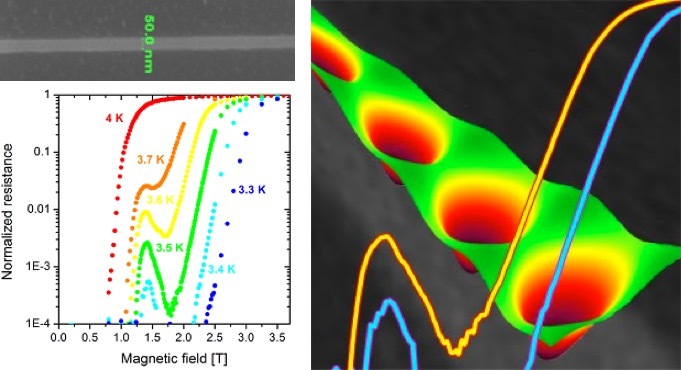 Focused Ion Beam (FIB) is a successful technology for nanopatterning. Given the higher weight of ions compared to electrons, a focused beam of accelerated ions (Ga+, Ne+, He+…) provides a high linear momentum with capability to remove material locally. As FIB does not require masks and provides high resolution (better than 10 nm), it has become a broadly-used technique for device prototyping, circuit edit and mask repair. In combination with a precursor gas, it gives rise to a local deposit. In this case, we talk about Focused Ion Beam Induced Deposition (FIBID). FIB and FIBID complement each other, giving rise to powerful subtractive and additive nanolithography techniques respectively. 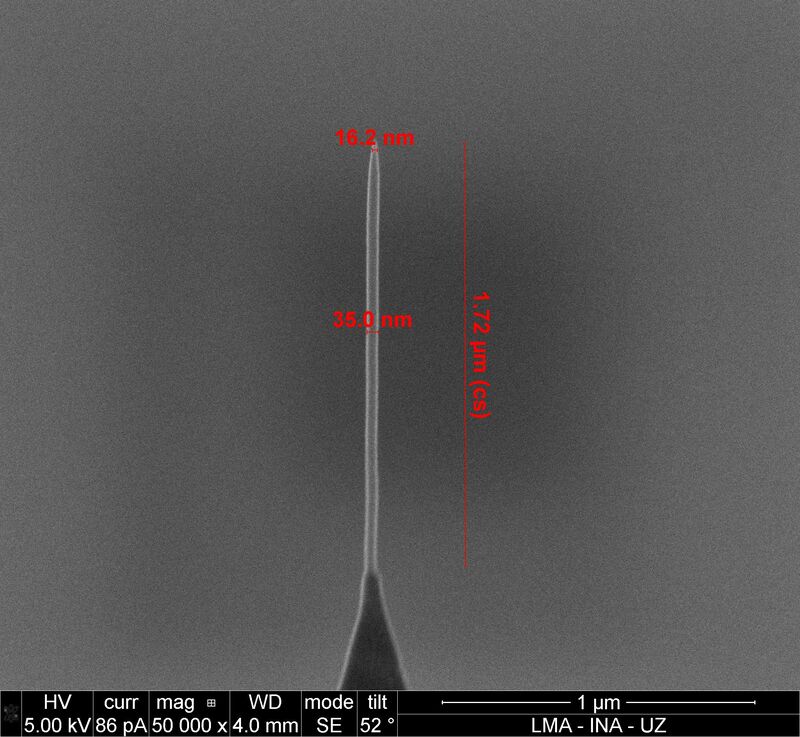 An example of such applications is the growth of narrow (50 nm) W-C superconducting nanowires where novel reentrance of superconductivity due to finite-size effects has been unveiled (see photograph). The following animation shows visually the FIB and FIBID processes. Focused Electron Beam Induced Deposition (FEBID) is a single-step additive lithography technique capable of supreme resolution and 3D growth. FEBID can be considered an electron-assisted Chemical Vapour Deposition (CVD) technique. 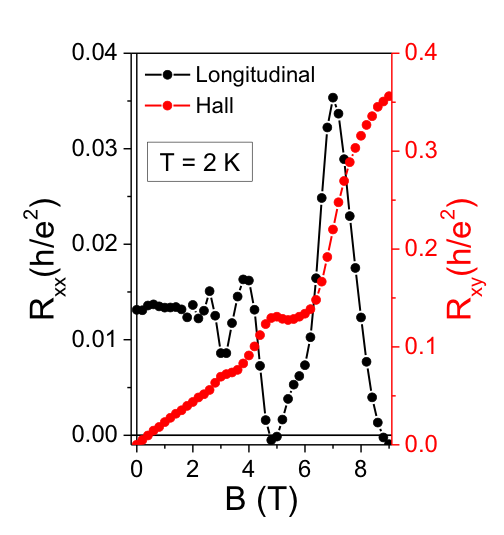 In this case, the energy required to dissociate the precursor molecules is not thermally sustained as in CVD but by the electron irradiation provided by a Scanning Electron Microscope (SEM) whilst the substrate is generally maintained at room temperature. The precursor molecules are delivered onto the substrate surface by means of a nearby gas-injection system (GIS) and the SEM is scanned on the substrate, creating a deposit with the same shape of the beam scan. 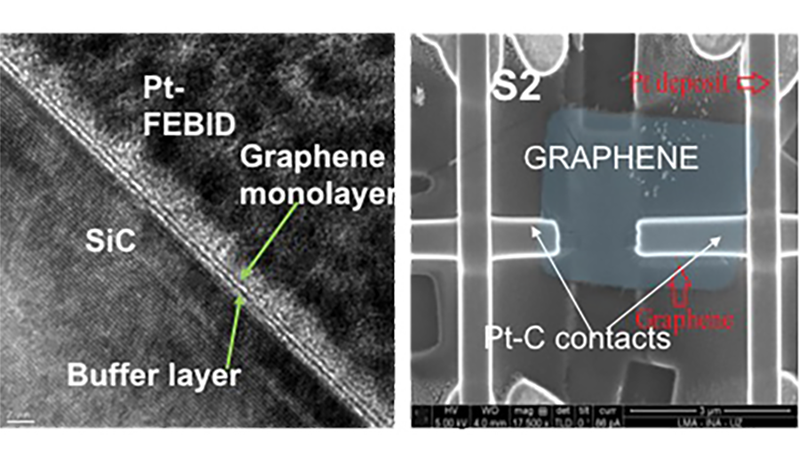 FEBID has shown resolution better than 10 nm, combining ultra-high resolution and simplicity, with various potential applications in Nanotechnology. An example of such applications is covered by our patent for the fabrication of customized magnetic tips for advanced Magnetic Force Microscopy (see photograph). The following animation shows visually the FEBID process. Magnetic and superconducting nanostructures, graphene, topological insulators and any other exciting patterned material you can think of! In the last decades, new materials have emerged leading to the development of more efficient elements in energy applications, highly-dense information storage, advanced sensors, new logic concepts, quantum information, etc. In the 80’s, magnetic and superconducting nanostructures were crucial in such development, with the introduction of giant magnetoresistive sensors in combination with tiny magnetic bits as well as the discovery of high-TC superconductors. Such materials continue to be key in recent technology developments in fields such as spintronics and nano-superconductivity. In 2004 the discovery of the amazing properties of graphene, a single layer of carbon atoms in honeycomb structure, represented a change in paradigm in the search of new materials. Ever since, new families of two-dimensional materials are discovered every year, expanding the horizons of condensed-matter scientists. In parallel, topological materials have emerged with unexpected physical properties and joining two apparently unconnected fields, those of solid state physics and topology. Such materials are expected to play a decisive role in future quantum-information technology. Nanofabrication of such new materials is a challenge, but is unavoidable to achieve relevant technology compatible with today’s nanoelectronics. Our Group is glad to take this challenge and carry out significant developments in the field (see photograph).